Home | Christina Steel Inc. Welcome to Christina Steel, Inc. 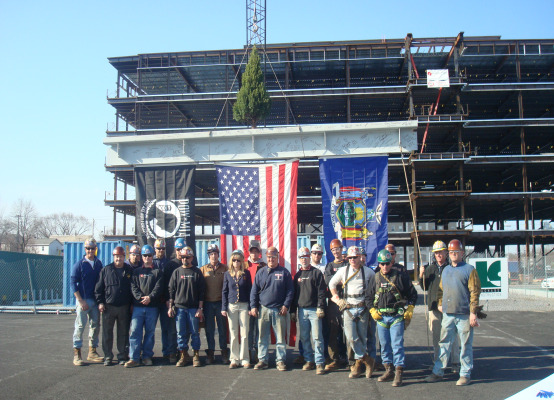 Welcome to our Website for Christina Steel, Inc.
Christina Steel Inc. was established in 2000, is a NYS Certified Women-owned Business and has been involved in building some of the largest and most challenging construction projects in upstate New York. CSI is proud to utilize a union labor workforce which include Qualified riggers and signalpersons. We specialize in the erection of structural steel and miscellaneous metals, including architectural and ornamental iron. We also perform rigging, retrofitting of existing buildings, crane service and a wide range of welding services utilizing A.W.S. Certified Welders. CSI is committed to maintaining a safe environment for our team, while providing the highest quality of service to our customers in the commercial, industrial and healthcare industry. We strive to not only maintain the project schedule, we most often accelerate it. In March of 2009 The Chamber-Vision for Business show cased Christina Steel Inc on the homepage for their magazine. The article "Framework for Success"enlightens the world on successful business womens.